The next time you sneeze, it may be a good time to visit a chiropractor. Yes, a chiropractor. 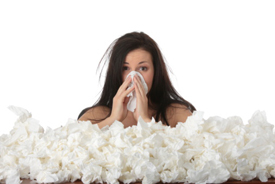 Most people never think about it, but chiropractic care can help provide allergy relief. That’s because chiropractic care, often thought necessary for only back and neck problems, can help with keeping the body operating at peak performance. The body’s immune system helps with preventing disease and infection, dealing with stress and overall well being. The immune system also tackles the invasion in a body of foreign substances such as pollution, dust, dead cells, etc. Current research is showing that there is a direct link between the nervous system and the immune system. Chiropractors remove nerve interference and allow the immune system to work optimally. Allergic reactions are the most frequent immune disorders and happen when the body’s immune system overreacts to allergens such as dust, pollen, pet dander, etc. The response is that the body overproduces neutralizing chemicals such as histamines to correct the problem. No one knows for sure. Some theories say it’s our increasing sterile environment. Others suspect the overuse of antibiotics and vaccinations. The idea here is our immune system is at its best when fighting off disease, parasites, and bacteria all by itself. The more we try and help it, the weaker it becomes. It is proven that children who live on farms and are exposed to different animals and the outdoors have fewer allergies than those who are not exposed. The answer is simple, chiropractic care releases stress on a patient’s nervous system. This allows the immune system to operate more effectively, which is beneficial to anyone and especially those suffering from allergies. The chiropractic approach is to remove subluxations, a term for a misaligned spinal vertebra pinching a nerve. Subluxations place stress on the nervous system. Free from nervous system stress, your body will work more effectively to neutralize the allergy-causing chemicals in your environment. No matter what disease or condition you have, you can benefit from a healthy spine. Spinal health can be as important for your overall healing as proper nutrition. Are you and your family carrying the vertebral subluxation complex in your spines? Only a chiropractic spinal checkup will tell. A healthy spine can improve your life – see your chiropractor for periodic spinal checkups.